"I'm still undecided whether the Brio3 is a fantastic little amplifier that outperforms everything at its price point, or if the ARTs are an incredible speaker that makes everything sound great even with modest ancilliaries. I'm sure it's a little of both." I said these words a few days ago, and it made me think about the Trenner & Friedl ART speakers that have resided in my system for the last six months. While half of a year is certainly not that long to have a piece of audio equipment in for review, I've felt remiss in not offering a formal review on the speaker I've decided is perfect for my needs. I suppose I was reluctant to offer any type of formal review on a pair of high-performance $4250 mini-monitors while my reference amp retailed for just $750. Now that I'm using the ARTs with the Heed Obelisk SI integrated amplifier and the X2 power supply--a combination that is truly synergistic in many ways--I feel I have a better handle on just how great the ARTs really are. Bob Clarke of Profundo, the US distributor for both Heed and Trenner & Friedl, put it best. "You probably won't want to ever trade in the ARTs as you upgrade your system," he told me at the 2011 CES. "They will really continue to blossom as your amplification gets better and better." Bob should know, since he uses the ARTs as his own reference speakers mated to the expensive VivA tubed amplfication from Italy. 1. Terry Combs, owner of Sound Mind Audio in Dallas, uses his ARTs in conjunction with the dedicated 78rpm system I talked about in the latest Vinyl Anachronist column for Perfect Sound Forever. Terry carries a lot of expensive speaker brands, but he keeps coming back to the ARTs for his own listening enjoyment. "If someone told me I had to listen to the ARTs and only the ARTs for the rest of my life, I'd say okay...thanks!" 2. 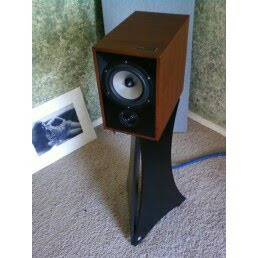 Before I listened to the ARTs, I was extremely enamored with a couple of British mini-monitors from a beloved and respected manufacturer. Since I've owned the ARTs, I've listened to these speakers on several occasions and actually came away unimpressed for the first time. The ARTs ruined them for me. 3. While listening to Trenner & Friedl's $170,000 Duke flagship speakers at CES, I came away thinking how similar the ARTs were in tonal accuracy and their ability to reproduce detail in a forthright and utterly musical manner. I have to admit that the Dukes are the finest loudspeakers I have ever heard, but when I returned home from Vegas and gave my ARTs an extended listen, I loved the little guys even more. The family resemblance, in other words, was amazingly strong--even considering the $165,000 difference between the two products. In some audiophile circles I frequent, I received a bit of flak from so-called objectivists who felt that the ARTs aren't that impressive when you look at their numbers, especially considering their price. One audiophile and longtime acquaintance, who prefers Vandersteens and vintage tubed amplification, asked me, "Are you trying to say that you couldn't find a decent full-range loudspeakers you liked for $5000?" (The slightly inflated price was the result of his estimate of a good pair of stands for the ARTs.) I thought about that question for a while, and realized that the answer was no, there was no full-range speaker in that price range that I felt bettered the ARTs in overall musicality. In my relatively small listening room (actually a small spare bedroom in a rather large house), the ARTs are able to sound dynamic, authoritative and BIG. They are able to throw up a gigantic soundstage, just like a full-range speaker. They play loud. They produce an amazing amount of bass for a mini-monitor. And they never fail to sound musical. I guess it eventually all comes down to bass, since the ARTs are nearly perfect in all other respects. The ARTs do go down to 44Hz, plus or minus 6dB. It's that 6dB spec that has the objectivists in a tizzy; if it was only 3 dB, then that would apparently be okay. I tend to focus more on that 44hZ spec, since I believe that it can be further reinforced with proper room placement and amplification. 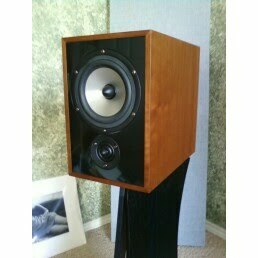 Besides, I think about some of the huge British loudspeakers I've owned over the years. 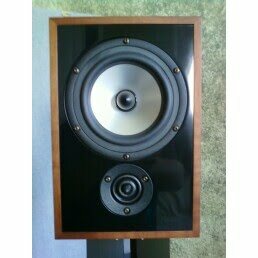 The Spendor SP100s I had for several years are flat down to about 45 Hz. 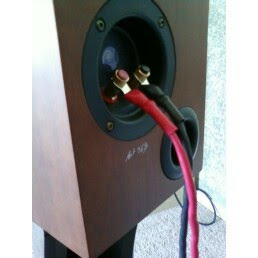 The $13,000 Harbeth 40.1s I used for about six months are flat down to about 39 Hz. Those are giant speakers with huge footprints. The ARTs are downright miniscule in comparison. While that 6dB blip is the reason why I can't honestly say that the ARTs are in the same ballpark low frequency-wise with those other speakers, they're relatively close. Close enough, in other words, that I really don't care about the gap. After living with the ARTs for the last six months, I'd say that I have the right amount of bass for at least 90% of the music that I listen to...maybe even 95%. There are certainly times when I know that a bass line is missing altogether, such as some of the subterranean bass guitar runs in the Flobots' excellent Fight with Tools CD. But the ARTs get so much right in the bass department that it's not that big of a deal. Double basses, for instance, are reproduced with the right amount of weight. Kick drums are visceral and potent. The ARTs' ability to throw up a giant soundstage certainly helps. As I've said before, lack of deep bass is less noticeable in a humongous soundstage. The ARTs deliver the type of soundstage that easily transcends room boundaries. I've been told that they breathe even more in larger rooms than mine, but that undermines my point about the ARTs excelling in small rooms. I've never heard a speaker, small or large, that does so much with so little. To illustrate this, I recently had Colleen Cardas of Cardas Audio listen to my system (The ARTs, by the way, are internally wired with Cardas cable). Colleen's first comment was "Wow, this room is small." Her second comment, after listening to a few selections, was "This sounds like really expensive systems do." In other words, if you want great sound in a small room, start with the ARTs. So what about the five to ten percent of my music that needs more bass? Well, I suppose I could consider a subwoofer down the line. 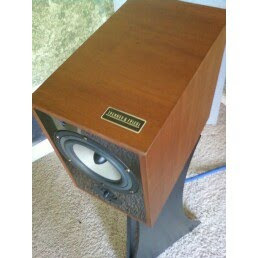 While visiting Dan Muzquiz, a Trenner & Friedl dealer in San Diego, I heard the ARTs mated to a Mingus subwoofer--a discontinued model from none other than T&F (I hope you've noticed by now that most T&F speakers are named after jazz greats, and the ARTs are named for Art Pepper). This was a thrilling full-range combination that gave me everything I could ever want--the same coherent musicality, the same unbelievable soundstage and the same thrilling dynamics. There was just a bit more bass. Not a screaming amount, just a bit. Okay, so I've beat the bass issue like a deceased equine, and it's time to talk about why the ARTs are so great. What else is there to say? Now that the Heeds are in place, I'm experiencing a sound that is easily the equivalent of some of the $50 to $75K systems I had at my disposal while reviewing gear for TONEAudio. I tallied up my system the other day, and came away with a slightly inflated (aka MSRP) price of $18,000. That includes the exquisite Clear Light cables from Cardas Audio, which account for a bigger percentage of the total than I usually reserve for system cabling. There are also some weak links in the system, such as a modest Rega P3-24 turntable and Zu Audio DL-103 cartridge, and a very modest Denon CD player. (I'm not really interested in getting an expensive CD player as long as I'm using our custom Blue Computer Solutions music server, although I might be getting one in the near future for review). I truly believe that the ARTs are great enough to make those pieces perform at their very best. The ARTs elevate the performance on the entire system, which explains my reluctance to point out the shortcomings of the Rega Brio3. (For the record, the Heeds underlined the fact that the Rega is a little gainy in the treble, and it isn't the most resolving amp in the world). The fact is, the Rega/T&F combination was much better than I expected. So in my humble opinion, the ARTs may be one of those rare components that can transform an entire system for the better. 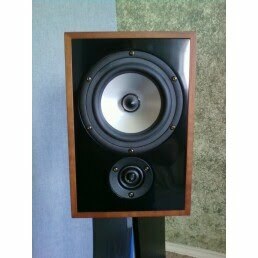 I haven't even mentioned the fit and finish of these remarkable mini-monitors. The cherry veneer is deep, textured and rich. The Corian baffles are translucent and make the speaker seem to glow from within, much like the music the ARTs produce. These are absolutely gorgeous speakers, a rare mini-monitor that radiates beauty without resorting to odd shapes or glued-on doodads. The proportions are unique; while the ARTs look tiny when faced dead on, they are unusually deep, a result of the fact that they are designed using the Golden Ratio. In other words, the ARTs are uniquely striking without being gaudy. The pride of ownership with these little gems is through the roof. So will I keep the ARTs forever and ever? That's hard to say, since I once said the same thing about my Spendor SP100s. All I can say is that if I do replace the ARTs one day, it will be with a speaker that is MUCH bigger and MUCH more expensive. And it will probably be sporting a Trenner & Friedl badge as well. I recently heard to the big RA model by T&F and was impressed. However, the low sensibility of the ART in comparison with the big ones means probably that the drivers are different, and probably the sound signature. Anyway, it's sure they know how to do speakers. - How do they perform at very low volume levels?. - How complicated are they as for room location?. Do they need more than 30cm between the rear part and the walls?. - Do they perform ok on bookshelves, not on their own stands?. - What's the minimal wattage they need to have decent dynamic range?. They really need solid state?. 1. I tend to listen at a pretty consistent volume level, so I'm not sure how well I can answer this. My experience would tell me that they would play better at lower levels with tubed amplification. 2. They're pretty easy to place and really shine in small rooms. Since they are rear-ported, you do need some space behind them. 3. I would never put a small speaker on a bookshelf, much less a $4000 one. 4. I've run them with a 12wpc tube amp and they sounded awesome. Not loud, but realistic. And so far they work well with both tubes and SS. thanks a lot for the quick answer. I'll try to demo them in my country, since I already had a chat with the importer when I heard the big RA model I guess it will be easy to arrange a demo. As for the stands... currently I can't use them, but maybe in the future. Real life listening rooms are like that. Do you know why are they always demoed in shows with Jeff Rowland stuff?. Andreas Friedl, the designer, uses Rowland in his reference system. I'd like to chime in a little review here. I gave a listen to these little speakers, and yes, they sound wonderful, energic, and fast. However, the woofers strained badly when played reasonably loud, especially during complex passage. I suspect those people at Trenner & Friedl toyed a lot with the crossover resulting in a non-linear frequency response. Positioning was also very tricky. Enlightenment? After two and a half years of ownership, I've never had this problem and I've used the ARTs with at least a dozen different amps. I suspect the issue was with the amp and not the speakers--the ARTs are not that efficient and need some power. They strained, but did they distort? Did it impact the quality of the sound? As a possible future owner, I am curious. this is an old blog entry, but you are one the few familiar with T&F and Joseph Audio, so here go some questions ;-). The Joseph Audio Pulsars are almost double priced than T&F Art. Is this difference of price justified in terms of coherence, musicality, low level resolution, phase coherence of the drivers... or they are just different flavors?. Personally I like from Joseph's that he has innovated on crossover technology and it's something more than beeing skillful in materializing old well proven audiophile designs. As for the upper range, JA Perspective and T&F Pharoas how do they compare, I know the RA are outstanding, but they are much more (too) expensive for me. Finally, considering real life conditions, i.e. listenning rooms within normal size apparments and the need of placing the speakers near of walls, what models are less demanding as for placement?. Rear ports to boost bass is always an issue with this, for instance the Devore Oranguntan need space from walk the to breathe plus distance from the listenning position to the drivers, ending up with more meters that one has in the living room of an apartment. Hi Santiago...the Pulsars go much deeper than the ARTs and sound much bigger. I don't know any bookshelf speaker that is so balanced through the bass than the Pulsars. But since I haven't had the Pulsars in my listening room, I can't compare them directly to the ARTs. I love both speakers and would be happy with either one. The Pearls, Perspectives and Pulsars all have a signature family sound...it just gets bigger and deeper as you go up the line. The Pharaoh/Isis/RA Box line has a very different sound than the Josephs--so I wouldn't put them up against each other. A closer comparison would be something like the T&F Dizzy or Ella vs. the Joseph Perspective. I have no idea who would win, but it would be a fun comparison. As far as room placement, the ARTs are great in small rooms. The best I've heard, in fact. They don't need a lot of space to bloom. thanks a lot for sharing your opinions.